Shared-use partnerships can be formal (based on a written, legal document) or informal (based on historical practice). Although many communities informally agree to share facilities, a well-crafted shared use agreement can help things go smoothly – from coordinating scheduling and staffing to handling maintenance and the possibility of injury. Also, when key personnel change, or when budgets shrink, informal agreements are more likely to be abandoned since there is no written accountability. Shared use agreements can range from simple to complex. To ensure success, the agreements require thoughtful planning and collaboration to address the costs and responsibilities incurred by opening up various facilities. Subject to state and local laws, shared use agreements can reallocate some or all of the responsibility for the costs, security, supervision, maintenance, repairs, and potential liability. 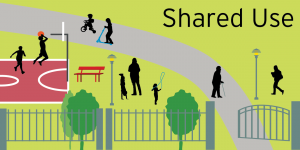 ChangeLab Solutions has created these practical tools to help your community create shared use agreements. We developed the Shared Use Playbook for public health advocates, community leaders, and local government officials who want to learn more about implementing shared use agreements. It compiles many of our tools and resources for formalizing shared use agreements into one comprehensive guide. Many communities lack safe, adequate places for children and their families to exercise and play. City, county, and town governments can partner with school districts through what are known as joint use agreements to address concerns about costs, vandalism, security, maintenance, and liability, and open access for the community. A joint use agreement is a formal agreement between two separate government entities setting forth the terms and conditions for shared use of public property or facilities. This checklist is designed to identify issues for the potential partners to consider when developing a joint use agreement. Just as there is no one model joint use agreement, there is no single method to develop an agreement. Successful agreements require a lot of thought, effort, and cooperation to reach agreement on a range of issues. We have developed a series of model joint use agreements to consider when developing an agreement for your community. Our nuts-and-bolts guide is designed to help school staff and other community leaders craft and implement joint use agreements. Complete with model agreement language and success stories, this toolkit provides a comprehensive overview of common ways to finance agreements and guidance on how to overcome obstacles that may arise. Many Native American communities lack safe, affordable spaces where children and families can exercise and play. Tribal Nations struggle with high rates of chronic disease, but are making significant strides in chronic disease prevention. Opening recreational facilities for community use is one way Tribal Nations can promote better health. Local governments often use resolutions to set official policy, direct internal operations, or establish a task force to study an issue. Our model joint use resolution was developed to help local governments lay the foundation for establishing more formal joint use policies and agreements. When government entities (or sometimes private, nonprofit organizations) agree to open or broaden access to their property or facilities, successful partnerships rely on the pooling of resources to expand public access and use public space more efficiently. We've outlined how both parties benefit from a formal, written agreement. What's the difference between a contract and a memorandum of understanding (MOU)? Our factsheet was developed to help you understand key terms and learn more about the legal techncal distinctions between these two types of agreements that can be used for shared use. Insurance coverage is one of the basic ways that nonprofits can protect themselves from the risk of liability. Nonprofits interested in entering into a shared use partnership will find this checklist helpful for assessing general insurance needs and understanding the steps and precautions for obtaining coverage.